As a kid, I was always the one with 'boy cut'. Trust me. Since my mom was working, and daddy would leave at like 6 AM in the morning when I would still be in bed, long hair was something that was not anywhere near reach for me. Who would braid it and blah :| That, until 4th standard. Once I hit 5th standard, I promoted myself to 'step cut'. Oh, the horror. So that story goes like I had this neighbor's daughter who was like 7 years my senior. She was my guru, obviously. Back then, I just wanted to be her. What? C'mon! She had the chicest bangs in the whole street okay? So one summer's noon, when mom and daddy were off to work and I was camping at home with granny, and that fateful noon granny being fast asleep, she convinced me to get 'step cut'. "It will make your hair look longer, just like Guppy's". So while I diligently listened to her I-go-to-college, boys-are-cute lectures, she cut my hair into several 'steps' and made 'bangs around' my forehead. I was happy with the cut, until mom came home and dragged me to salon aunty. I still remember the salon aunty screeching in horror, "OMG! What ate away at her hair like that?" Guppy = same aged bestie I had a love-hate relationship with. From that day, I gave up on my guru and also the love for long hair. I don't know what the curse was, starting from that day, I have managed to grow my hair to around 5 inches below my shoulder. Fast forward to three months ago, I was again reminded on my curse when my pretty-damn-well-behaved hair underwent major trauma as it developed crazy split ends and dry hair. The condition was so horrible, all I could do to make my hair look human and presentable was to twist it into a messy know and fix it to my skull. Come rain or shine, internals or seminar, jeans or kurta, I stuck with the hairstyle for a month because I didn't have the heart to snip it away. 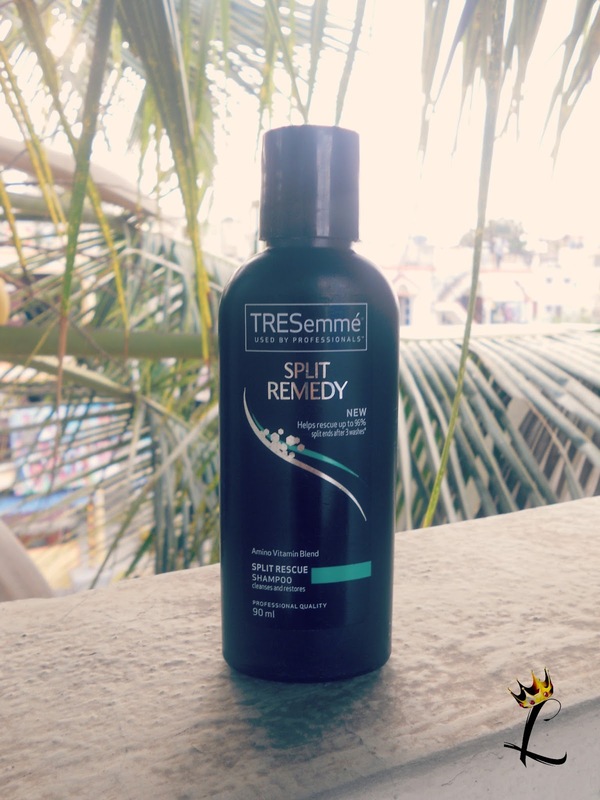 Right around this time, TRESemme's PR sent across a press release and I decided to give this range a try, what with TRESemme always keeping the promises and being my HG shampoo and conditioner. Shampoo and conditioner come in regular package and smell gooooooooooooood. The conditioner, however, is different. 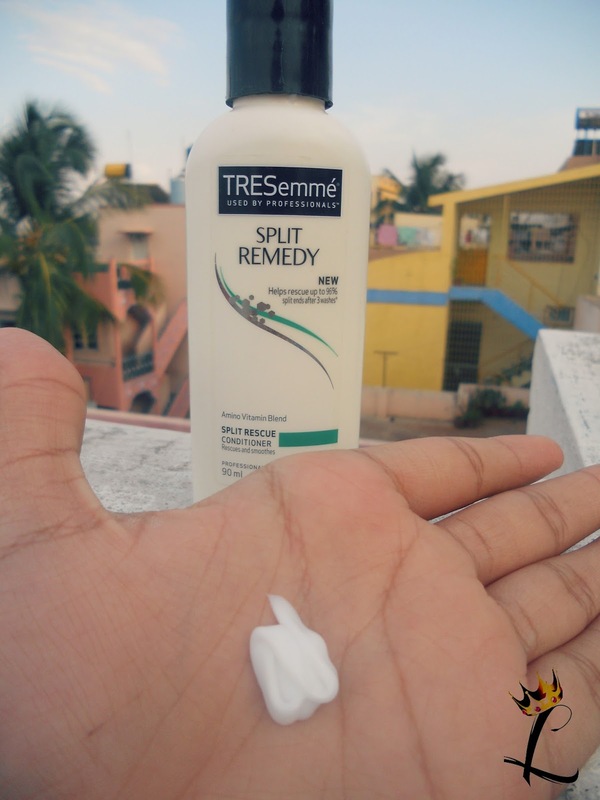 Its thicker than the usual TRESemme conditioners and the texture sort of spreads easily. What I mean is it doesn't require too much working through wet hair for it to spread, though its thicker. Instructions to use are the typical one, too. Now coming to the tall claims of 'reversing the split ends', let me tell you how it fared on me. 1. It stopped, or at-least reduced any new split ends. 2. The dryness reduced to a large extent. 3. It sort of moisturized the tips, so the split ends looked lesser. So basically, my hair felt a lot softer. On the day of hair wash until my hair dried to 100%, it would feel coarse and dry. But the day after wash until I washed it again, the tips were weighed down, you know what I mean. So yea, overall, it helped me handle the splits to a neat extent. I didn't see any major changes up to 4 washes. After the fourth wash, when a friend asked if I got a little trim, I knew it was working okay. 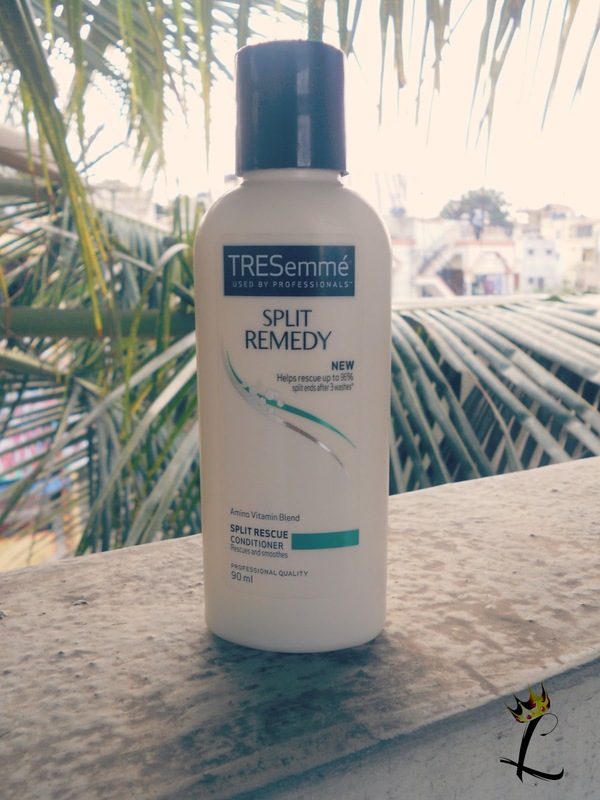 Though TRESemme claims 96% reduction, I will say it worked around 80% for me. I mean c'mon, hair so damaged, it is no magic potion. Plus, my hair is ever-so-thirsty and porous, its always edging close to dryness. Overall, I am extremely happy with the results. It made my hair manageable and style-able until I got a proper trim. 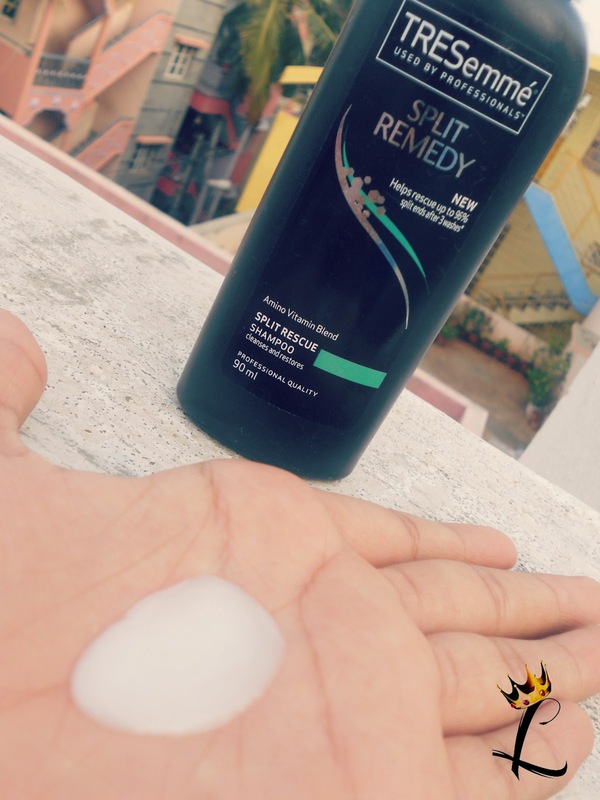 It definitely made handling hair better and yes, when the stylist analysed my hair, he didn't feel the need to chop off inches together, he just trimmed away hardly half an inch. "Split ends are average, ma'am. I don't see the need to snip too much". 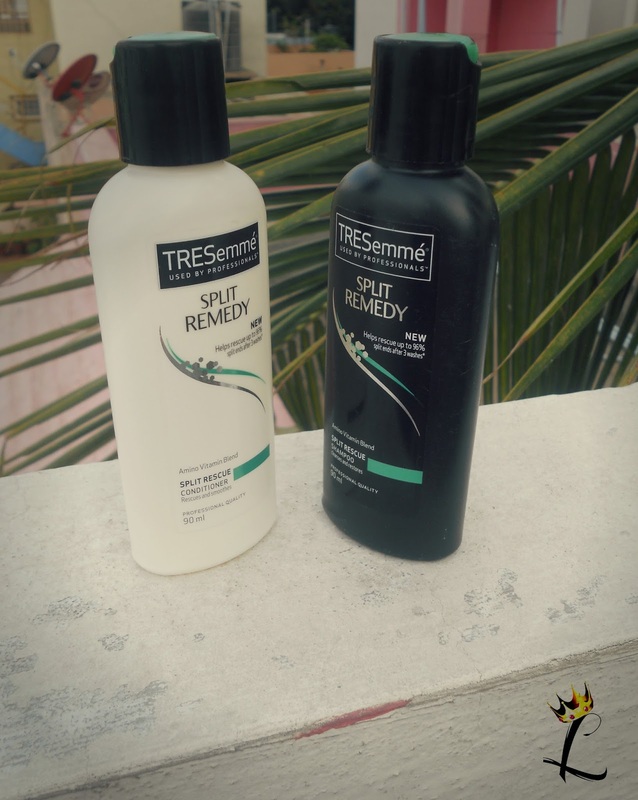 So if summer's bothering you and you want a shampoo conditioner duo to handle rebellious hair, do give a try. Oh and yes, I have washed my hair pretty much every alternate day. It wasn't harsh and there was no hair fall. 1. Reduced split end appearance. 3. Tips were weighed down, like the fried ends weren't that obvious. 4. No hair fall in-spite of frequent washing. 1. Umm, the conditioner could have moisturized a little more, may be? So yea, that's about it. I am going to stick with this through summer, though I have trouble free hair at the moment. 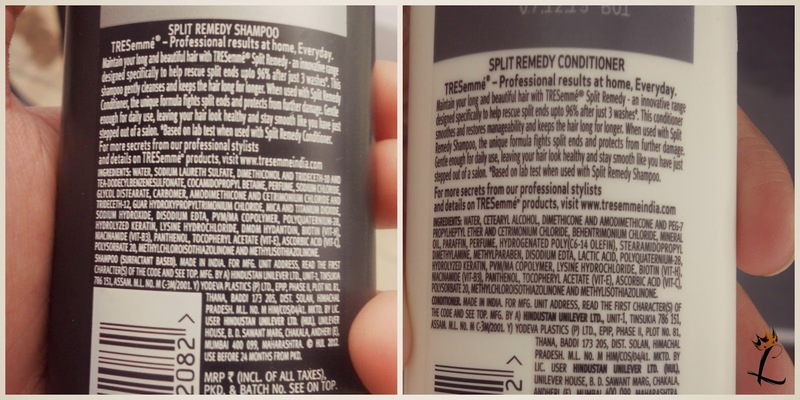 I think TRESemme shampoos have great quality! They have, almost all the time!